I guess you could call this "Adventures on the Road, part III", as the beginning of this story takes place during the end of our road trip mentioned in the two previous posts. As people are wont to do on a road trip, we stopped at many a service station on our day of driving home from Cape Cod. At each stop, we would assess the car's gas level, our hunger level, and how strongly we needed to visit a rest room. We would, also, put the dogs in their harnesses and let them hop out of the car to walk around for a bit in order to stretch their legs and take care of business. Leopold, you have gum on your paw! As you may know, service stations are not the cleanest places--inside and out. At one of these not-so-clean service stations, Leopold stepped in gum. At the time of the gum adhesion, I actually thought the substance I saw on his foot was mud, and didn't worry too much about wiping it off. A little mud never hurt anyone. The following day, however, we were out on our walk when I noticed that the "mud" was still on Leopold's foot. I stopped to investigate ("Why isn't this mud falling off?") only to discover it was actually a hard wad of gum. It had mushed right into his paw pad, up around his nail, and into his fur. 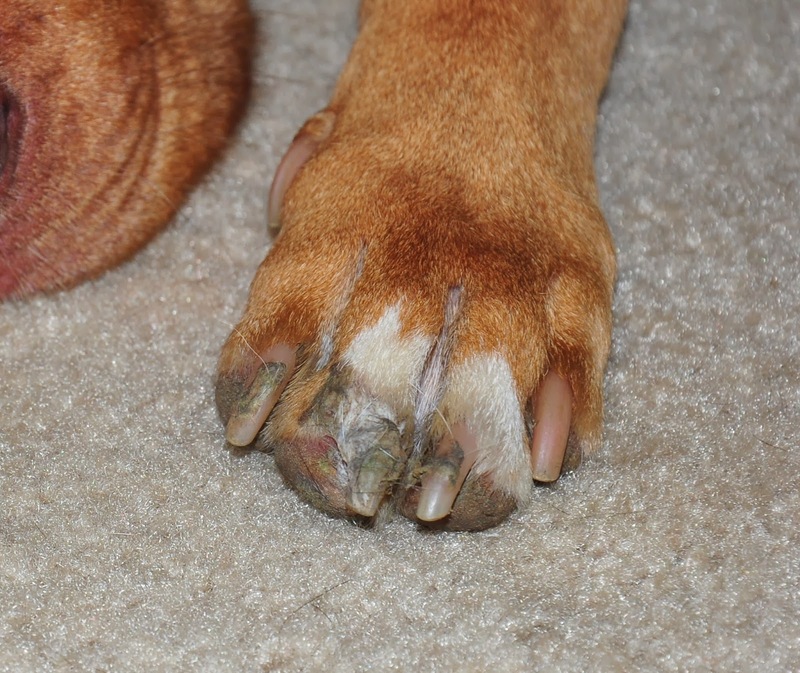 Once we got home, I looked up home remedies for curing "gum paw". 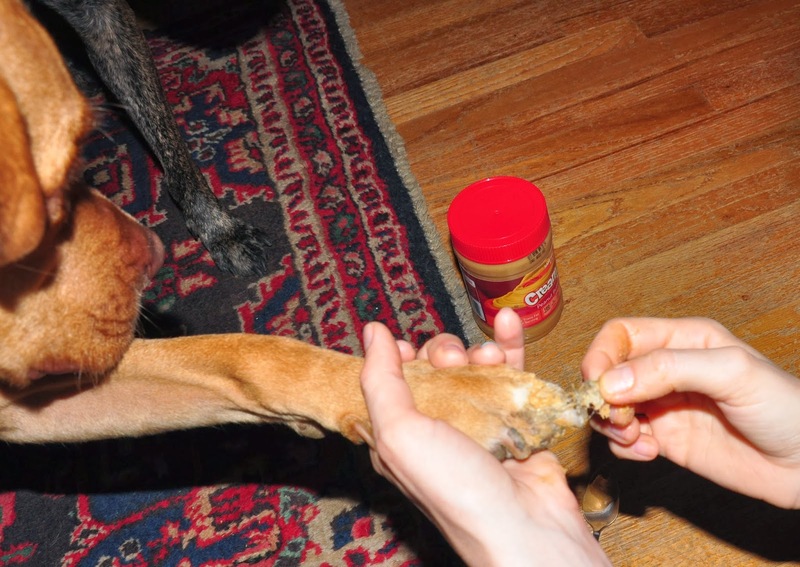 Just like getting gum out of human hair, many people recommended peanut butter. So that's what I tried. I am pleased to report that peanut butter worked like a charm! 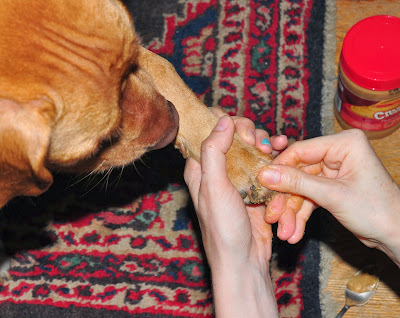 I massaged the peanut butter onto the gum wad, and it almost immediately started to release from Leopold's fur, nail, and paw pad. Leopold's paw was gum-free in no time. I was happy that the solution to this problem ended up being so easy. And Leopold was happy that his paw tasted like peanut butter afterwards. the gum is starting to come off!